The connection: In an alternate universe (i.e., my fanfic), some groovy vegan chef made this for a hungover Janis; yada yada yada, the two fell madly in love, moved to Texas, adopted a bunch o’ cats, opened a combination farmed animal shelter-slash-vegan bed and breakfast, made delicious music and beautiful foods, and lived happily ever after. THE END. I can’t even remember the last time I had an omelet! In my non-vegan life, I was more of a fried egg girl anyway. Omelets and scrambled eggs? Not really my favorite. But the Hangover Tofu Omelet in The Tipsy Vegan looked simple and tasty – not to mention, it fits this Janis Joplin song most perfectly – so I decided to give it a whirl. 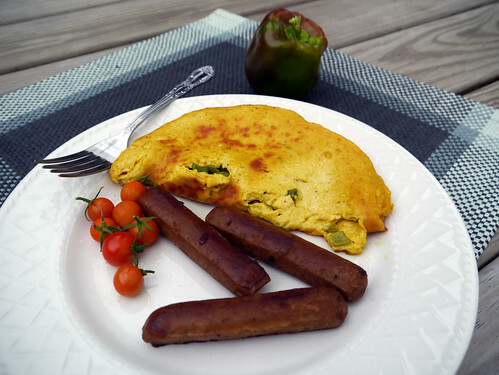 Marsala wine adds the “tips” to this omelet – but the taste is so subtle that you could easily omit it if you don’t have any on hand. (Though this kind of negates the point of the cookbook!) The silken tofu base is also seasoned with nutritional yeast, tahini, onion, garlic, and paprika, as well as a red (green, in my case) bell pepper sprinkled in the middle. Basically you blend everything but the pepper together, and then fry it on an oiled skillet until the underside is golden brown. 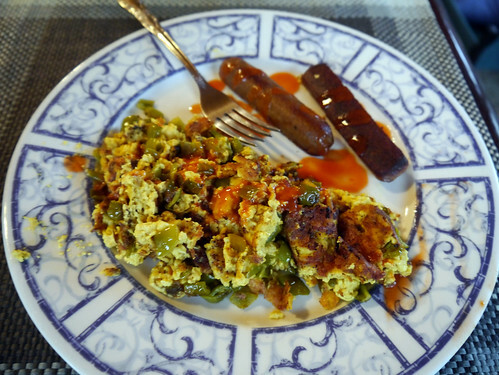 Fold (the peppers, previously on the top, are now sandwiched comfortably in the middle of the omelet), cook for another minute, and serve warm with a few Lightlife breakfast sausage links. All in all, it’s pretty tasty, though methinks it could use a little extra seasoning. Some fresh onion or minced garlic, maybe? Also, I’m partial to the crispy parts, so next time around I might just flip the whole thing over instead of folding it into an omelet. Bonus points for burned parts! Pro tip: if your omelet sticks to the skillet and you’re not able to flip it properly: GO WITH IT! Make scrambled eggs instead. That’s what happened to Shane’s omelet. The recipe only serves one, but you can easily double it to make two omelets. That way you won’t end up with extra tofu going moldy in your fridge. I hate having opened perishable ingredients sitting around, yo! This entry was posted on Sunday, October 7th, 2012 at 12:01 pm. You can follow any responses to this entry through the RSS 2.0 feed. You can leave a response, or trackback from your own site. Looks mighty fine! Can you make one for The Sheriff? He was out late last night chasing an outlaw! MoFo Theme: Homesteadin’ it in October!